34 out of 167 neighbourhoods (LSOAs) are now amongst the most deprived 10% in England compared to 41 in 2010. 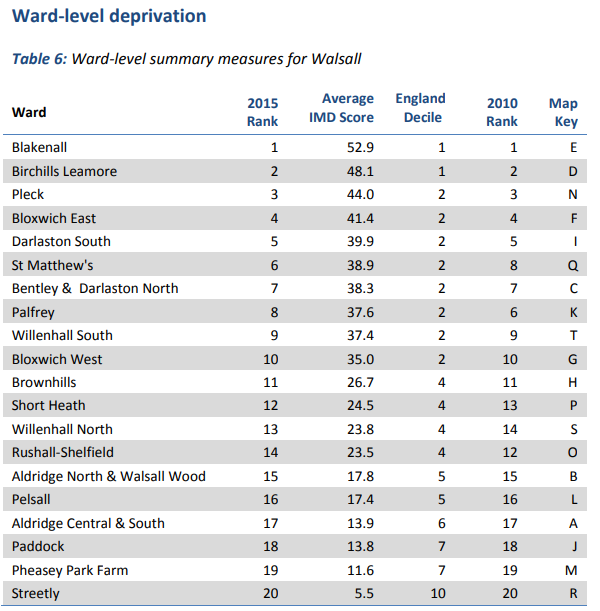 The 2015 Index of Multiple Deprivation now ranks Walsall as the 33rd most deprived English local authority (out of 326), nudging Walsall just outside the most deprived 10% of districts in the country (30th in 2010 and 45th in 2007). 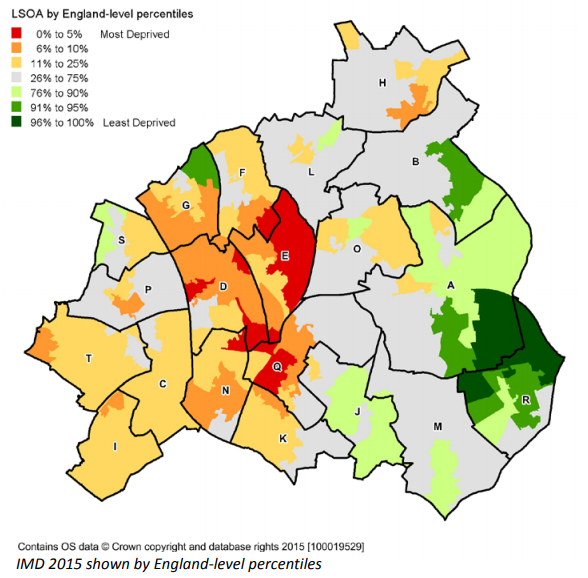 There are extremes of deprivation, with central and western areas typically much more deprived than eastern areas, although pockets of deprivation exist even in the more affluent parts of the borough. Walsall fares particularly badly in terms of income (18th), employment (30th) and education, skills & training deprivation (12th), and many of the issues that challenge the borough match the geography of deprivation. The high and increasing levels of child poverty puts additional demands on services. Walsall ranks 18th of 152 upper tier local authorities for income deprivation affecting children index (IDACI 2015) with the Borough’s relative deprivation increasing over time. 1 in 3 (29.9%) aged under 16 years are living in low income families, higher than the national average of 20.1% (HMRC, 2016). By the end of January 2017, 20.8% of primary school pupils were entitled to free school meals compared to the national average of 14.5% and 19.1% of secondary school pupils compared to 13.2% nationally (DfE June 2016). 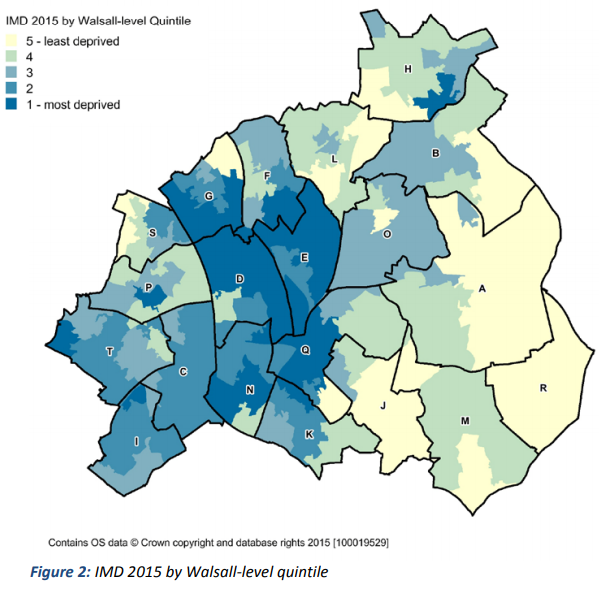 The latest IMD report contains a full analysis of deprivation across the Walsall Borough. Please click this link to download. A new Index of Multiple Deprivation is due to be released in the summer of 2019 - be sure to check back here for the latest analysis! The following map displays the geographical picture of deprivation across the Walsall borough, ranked against England as a whole. The colour shaded LSOAs (Lower-layer Super Output Areas) rank the most deprived as red & least as green. For instance, we can see that Area E (Blakenall) has a high proportion of the most deprived LSOAs in England, whereas parts of Aldridge & Streetly feature the least. It shows a very diverse picture, with east & west radically different from one another. The following map groups the LSOAs into quintiles ranking them from most to least deprived. This also displays the gulf in deprivation geographically, between east & west.